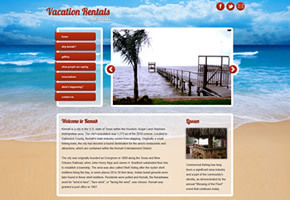 When it comes to generating income from a holiday home, your web site needs to grab attention from the first landing page. 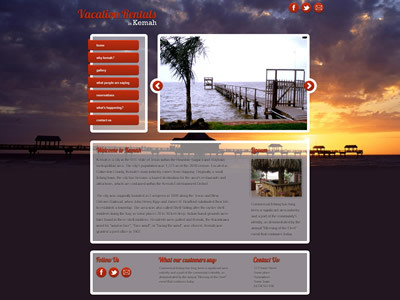 For this property in Kemah, Texas, we needed to also allow for multiple photo galleries, a customised slideshow and also showcase larger images as part of the overall page design. 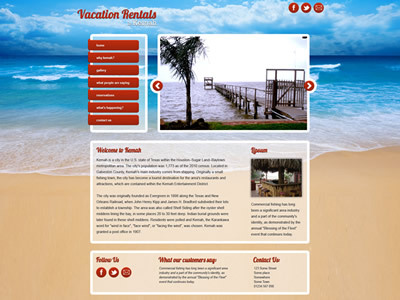 As a result, the site includes a large background image, which can be unique to each page, with a semi-transparent content area which can hold additional images or photo galleries. The site also includes some subtle effects for user feedback, including hover images for social networking icons and fly-out navigation to simplify the use of the site.